Reggie Darling: Bring Me the Rubirosa! 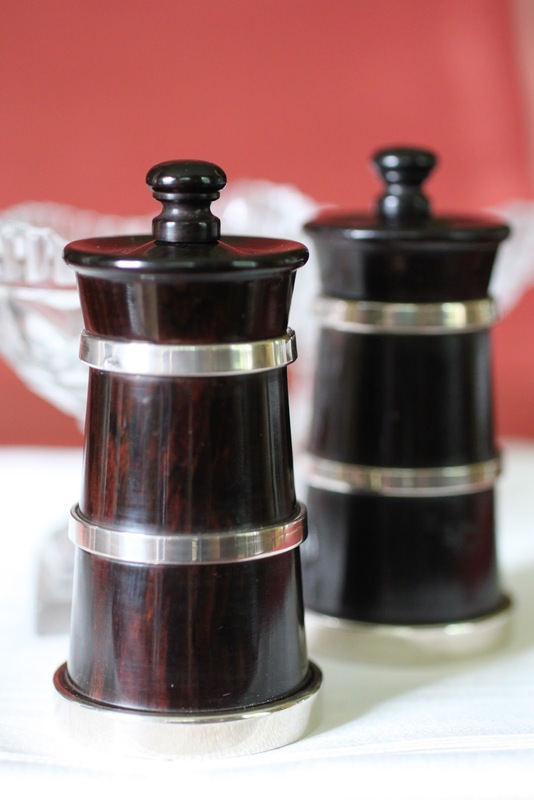 Reggie, the silver-banded ebony salt grinders are perfectly beautiful. At table we use Yeoward crystal salt cellars (bone spoons) and in the kitchen it's Alessi salt and pepper grinders - plastic, I'm afraid. I have lovely silver salt cellars and wonderful silver salt and pepper shakers, but generally use a pepper grinder and sea salt. "Rubirosa" - I haven't heard that term in ages. It's one of my favorite stories in the annals of cookery. We have two tall Mid-Century acrylic shakers that have shaker tops and grinder bottoms. One holds white pepper and black pepper corns; the other holds black pepper and sea salt. I make salt and peppers in my clay studio. Your post prompted my latest blog entry at http://jeanetteharrisblog.blogspot.com. As I love freshly ground pepper, it is 100% grinders/mills. As I collect Swedish Neo-classical furniture, my salts are in the form of tiny Viking ships, in silver and in pewter to suit the occassion. For entertaining, sterling salts and an antique ebony and sterling Rubirosa that I treasure. But the last one in the post with the P is by far our favorite and one we use on a daily basis. It is by far the best. Porfirio Rubirosa was a friend of my aunt and uncle's and came to Cuba frequently to play polo while married to Flor Trujillo, the dictator's daughter. I could never see the attraction he had for women, but then again I was only a youngster and what did I know of those things. Years later when his reputation with women became the thing of jokes and inuendos, I wished I had payed more attention! In the city kitchen, I use Peugeots grinders of different sorts. 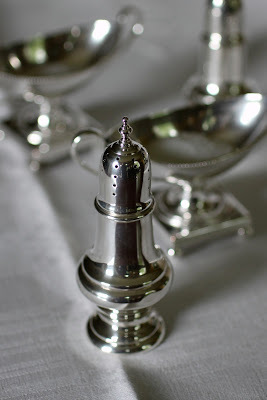 There are a pair of sterling swan salt cellars we sometimes put on the dining room table -- but always empty, as I don't really approve of putting grinders or cellars on a dining table. I am rather lusting after the banded ebony grinders you have. They look like fabulous little chess pieces. Just perfect! 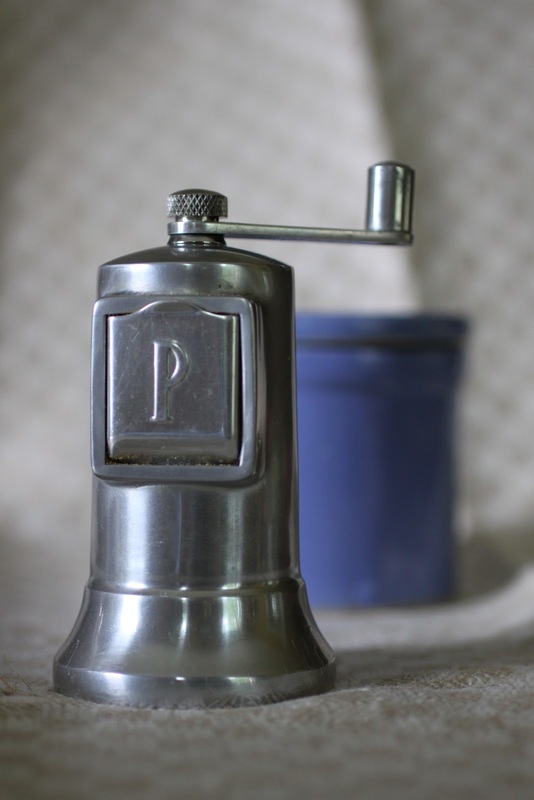 I always use a grinder for the pepper and I have a preference for wooden ones, like the vintage Dansk grinders. They feel lovely in the hand and are beautifully designed. Currently we use a handmade grinder of koa wood I found in a shop near Kona, HI, paired with a depression-era glass salt shaker (with a few grains of rice of course) for more casual use. My heirloom salts I don't bring out that much- you have to store them empty because the salt tends to pit the silver over time. I've been looking for interesting glass salts for ages because deep down I sort of disapprove of salt shakers at the table. Rubirosa,haven't heard that name in an age. He also was a paramour of Zsa Zsa Gabor. In the kitchen until very recently I used to use a French,wooden pepper grinder given to my parents for a wedding present in 1954. I dropped it and a massive chip came off from the side, and it wouldnt grind properly again. Now I buy pepper corns in a glass jar with a plastic grinder. I know. I'm not very into food prepartion/cooking accoutrements I'm afraid. Zsa Zsa was no fool, her only regret was that she never married him, though. Pictures of her laughng at his marriage to Barbara Hutton are quite delightfully mean and wicked. Rubirosa! Ha! I'll never look at a pepper grinder the same way for the rest of my life, Reggie! We, like you, always use pepper grinders (old, family pieces) and glass salt cellars. Within the family, we never use a spoon with the cellars as salt destroys silver. With guests, we add a small salt spoon. We were told at the silver smith at Colonial Williamsburg that silver spoons required frequent replacement for that reason. I don't believe I own a salt shaker any longer. We use small dipping bowls as salts next to the stove and for casual meals. Unfortunately, most guests are baffled. Unfortunately, those beautiful pepper shaker heirlooms have to be put away, because fresh-ground pepper is the only way to go. My favorite grinder used to be a painted wooden one that finally wore out; my current one is heavy cast blue-anodized aluminum. I had thought that salt grinders were too fussy, but I recently got one and like it. An interesting side-note is that while some antique salt and pepper shakers were made in China, mostly for export, occasionally one comes across shakers with very fine holes which are for sprinkling medicine, not pepper. Yes, pepper mills are used in our household too, both for white and black peppercorns. I absolutely love the milk churn form of the ebony and silver ones you use, a classic British design I believe. For salt, we use a small collection of Regency glass salt boats at table, and glass custard cups hold kosher salt on top of the stove for easy access while cooking. Oh, this brings me back. I spent my entire college career in the early 1970s waiting table in just the kind of Continental restaurant that Anonymous3:07 describes--I think he must have had one of our old menus in front of him. We were noted for the quaity of our steaks & seafood, the opulence of our all-red decor & for having the biggest Rubirosas in town. And just to make sure that nobody missed them, while our Rubirosas awaited the call to service, they stood at attention in their own spotlit niche in the center of the room. Very continental. And yet here's the thing: in my pink-cheeked innocence--and senior in college or no, I was innocent--I always assumed that our Rubirosas were, like Veal Oscar & Shrimp DeJonghe & Bananas Foster, named after the restaurant or chef that first popularized them. I never bothered asking, and maybe it was just because of my propensity to blush at the slightest provocation that nobody ever told me otherwise. At any rate, it wasn't until a few weeks before I graduated in 1976 and moved on, that I read Truman Capote's "La Cote Basque, 1965" in the latest issue of Esquire and learned to my chagrin the spicy backstory of what I'd just spent the last five years brandishing under the noses of my customers, including, one time, the ultra-conservative Phyllis Schlafly, who, then, in Peoria, was held in the same esteem that Sarah Palin is held in certain circles today. I had forgotten all about that little episode of my illustrious career. I am ALWAYS late to the posts that inspire me to comment. My pepper grinder in the kitchen is an old Turkish coffee grinder...brass. It's amazing what one will become obsessed with during the division of marital property. 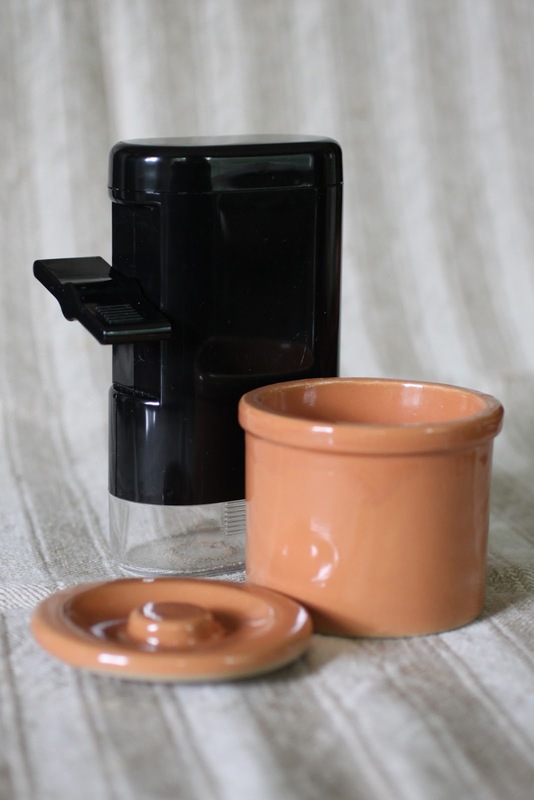 Premarital assets are usually a non-issue and my coffee grinder was mine pre-betrothal. But I was so worried that LFG's mom was gonna want my brass Rubirosa that a month or so before the movers came to cart away our halved possessions, I hid the thing in the trunk of my car. As for my other Rubirosa, she'd long-since lost her desire to twist the handle on that one. What a great post. It's funny isn't it, how figuring out these small details adds so immeasurably to life at home. 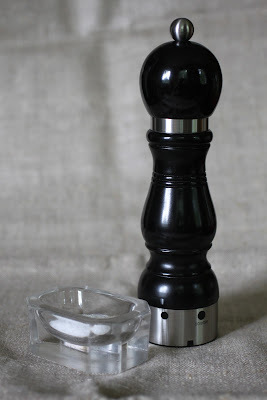 I've started using tiny individual salt and peppers for entertaining, and in the kitchen I have a salt cellar with Kosher salt for cooking, but I have had no luck with pepper mills. Usually it is the grinder mechanism that fails. Even my last one, a fancy schmancy lacquer model with a Peugeot grinder, ended up dying. Will hop over to S & S and check out yours! N.G. The sugar casters never looked so good on our dinner table! Hello, could you tell me the brand or where I could get the metal pepper mill with the P on it? Thx!